Welcome to Jim's 'tuneful' outpost on the web. Having grown up in a musical family (mother-sister), I have been exposed to many musical genres, however, my true taste lies somewhere between folk, rock, surf, the blues, and counterculture `60s. In fact, much of my favorite music is from the decade of the 1960's and early 70's. The following are the tip of the iceberg when it comes to favorite performers, but they rank at the top. I have seen many of these artists live, and even met (yes you will see a slew of autographs and custom pictures here) a few. Beyond the music, I like what many of these artists represented in their day, insofar as an attitude, a certain sound, or just plain coolness. Also, many of these artists continue to perform, which given the toughness of their business speaks volumes about just how special they truly are. Anyway, enjoy! Tour photos and Videos are now available! Check out performance photos and much more!! Leo Kottke Simply one of the acoustic guitar greats of all time. His early release, 6- and 12-String Guitar, is still a "bible" for fledgling guitarists. Austin Music Austin, is called the live music capital of the world. Check out blues great Lou Ann Barton, Jimmie Vaughan, Electromagnets, Storyville, and many more . . . The 5th Dimension This is The Dawning of the Age of Aquarius. Los Straitjackets Damas Y Cabelleros prepare to experience one of the greatest surf-rock instrumental groups of the late 1990's and New Millenium! The Moody Blues Days of Future Passed--A symphonic life journey from morning's promise to evening's closure. Lil' Ed & The Blues Imperials For searing slide guitar, and what can only be described as an interactive show, check out Chicago blues great Lil' Ed. Eric Burdon Eric Burdon's group The Animals was among the hottest mid-1960's British invasion groups. His unique voice, as well as persona continue to delight audiences. Maria Muldaur "Send your camel to bed," Maria suggested in Midnight at The Oasis. Dickey Betts The ex Allman Brother's Band lead guitar now heads up Dickey Betts And Great Southern. Spanky & Our Gang A 60's group out of Chicago, with hits like Sunday Will Never Be The Same and Lazy Day. Don Walser Don Walser, a purveyor of "old-time" Texas C&W-Folk music, was simply one of the great yodeler's and nice guys of all time. He's hung up his hat, but check him and his Pure Texas Band out anyway! Cindy A tribute to my sister. Jimmie Vaughan Jimmie is part of a Texas guitar dynasty. See him on the road, along with Austin's Queen Of The Blues, Lou Ann Barton. Johnny Winter One of the greatest blues and rock and roll guitarists of all time! Clarence "Gatemouth" Brown Gatemouth Brown has left us to do his fiddling and guitar for a new audience, but his memory lives on! Freddy Fender & Doug Sahm Freddy Fender and Doug Sahm have now both departed for TuneFan Heaven, but these giants will long be remembered! John Mayall A founding father of British blues. Don McLean Mr. "American Pie" ! Leon Russell Leon's life has always been "Up on A Tight Wire"
Edgar Winter Hits include Frankenstein and Free Ride. See `99 Tour with Rick Derringer. Riders In The Sky As Ranger Doug Always Says: "It's The Cowboy Way"
Ronnie Dawson Ronnie Dawson departed for Rockabilly Heaven in 2003, but his spirit lives on! Robby Krieger Best known as lead guitar for the iconic 1960's rock group The Doors. Robby continues to delight audiences into the 21st century. Proof positive that Huxley's "The Doors of Perception" is a reality! 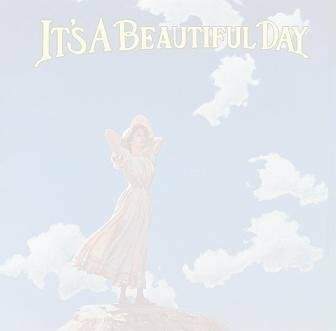 It's A Beautiful Day A staple of the 60's San Francisco music scene. Best known for White Bird. Pink Floyd The Dark Side of the Moon--nuff said. Potpourri Ticket Stubs, Autographs, and 'Rogue' Stuff! 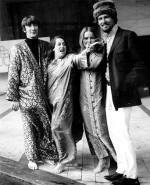 The Mamas and the Papas in London, England, in 1967. From left: Denny Doherty, Cass Elliot, Michelle and John Phillips. Denny Doherty, the voice of The Mamas and The Papas, a seminal 1960's music group, has departed for TuneFan Heaven. Monday, Monday will not be the same, but Mr. Doherty's contribution to our musical enjoyment will live on. Beginning in the 1950's, electric guitars became crucial to the whole amplified sound movement. Two mainstays of plugged in guitar are Fender and Gibson. Check out their sites for history and great pics of vintage tune players. Speaking of Guitars, TuneFan Nick has a Tune Player (acoustic guitar) he lovingly calls 'MS Delta,' which is named after a derivative of the name Mississippi Delta Blues. Additional MS Delta photos may be seen here. Many thanks to Nick for taking time to obtain signatures of 'the great ones,' and share it with TuneFans the world over!